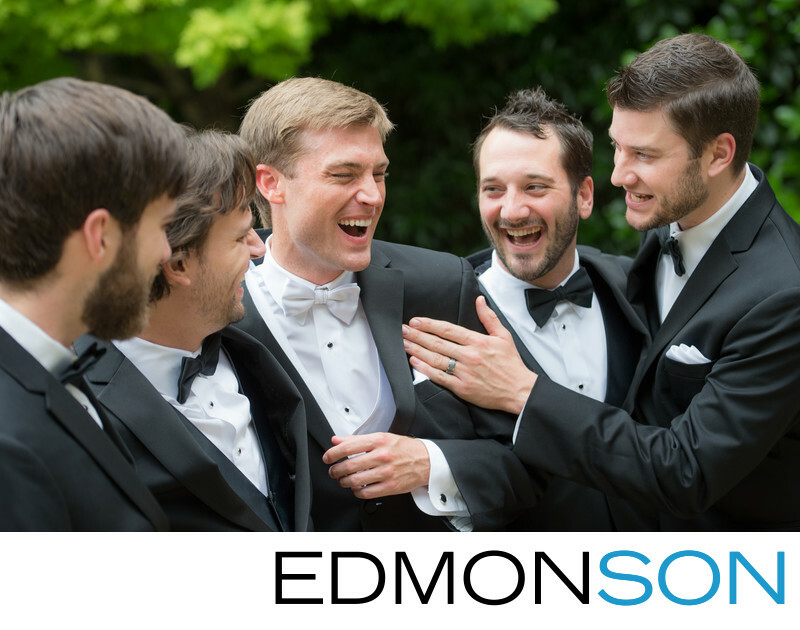 From your best man to your best friends, groomsmen are there to support you on your wedding day. Let's face it, part of the brotherhood includes having fun at each other's expense. In this wedding photo, the groom is framed by two groomsmen on each side of him. Shot in a photojournalistic style, two men are in the foreground with the camera shooting slightly over their shoulders. That provides a framing element directing the eye to the groom in the middle ground. In the background one groomsman is placing his hand on his buddy's chest. There is a sense of joy and anticipation to this natural moment before the wedding ceremony. The warmth of the color photo contrasts the soft green foliage in the background with their formal tuxes including bow ties. The groom's squinting eyes add to the authentic nature of the moment and whatever is being said or done. The photo is taken in the backyard of a private residence before the wedding in Plano, TX. One of the tips to taking better wedding photos with your bridal party is to use the elements of foreground, middle ground, and background to provide depth to the picture. By shooting down the line of men, the center of interest becomes the groom and his interaction with his comrades. Giving permission for individual personalities to express themselves allows for natural expressions and believable gestures. 1/400; f/5.6; ISO 400; 92.0 mm.